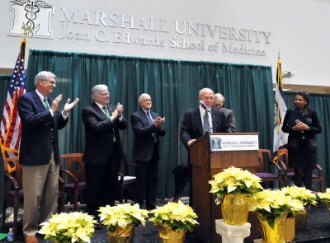 HUNTINGTON, W.Va. – The new Charles H. McKown, M.D., Translational Genomic Research Institute at Marshall University’s Joan C. Edwards School of Medicine was dedicated in a ceremony last week. The facility was named in honor of McKown, who served as the school’s dean for more than 22 years before becoming Marshall’s vice president for health sciences advancement this summer. The Marshall University Board of Governors cited McKown’s “extraordinary service to the University” in approving the facility’s naming. Dr. Robert C. Nerhood, interim dean of the medical school, said McKown’s contributions to the medical school were many. Nerhood said the genomic research facility is an outgrowth of McKown’s vision and advocacy. “Dr. McKown foresaw the importance of the new field of translational research in the area of cancer care,” and then worked with philanthropist Joan Edwards and U.S. Sen. Robert Byrd to turn that vision into reality, he said. In addition to Nerhood, speakers at the dedication ceremony included Marshall President Stephen J. Kopp; Dr. Richard Niles, senior associate dean for research and graduate education at the medical school, and professor and chair of the university’s Department of Biochemistry and Microbiology; Edward Seiler, director of the Huntington VA Medical Center; and McKown. Videotaped greetings were given by U.S. Sen. Jay Rockefeller, U.S. Sen. Joe Manchin III and U.S. Representative Nick J. Rahall II. Gov. Earl Ray Tomblin was represented by Jacqueline Proctor, his director of communications. A reception and tours of the facility followed the dedication ceremony. The Charles H. McKown, M.D., Translational Genomic Research Institute is located on the top floor of the Edwards Comprehensive Cancer Center. Completed this summer, it includes more than 10,000 square feet of research space and has advanced scientific equipment including a “next-generation” genetic sequencer. Several university researchers already are working at the institute. In addition to naming the facility after McKown, the medical school has established a scholarship in his honor.